Amazon has come out with a new feature that allows you to test drive apps on your computer from their website. This feature allows you to use a paid app for free with some restrictions. This is especially nice for apps that don't have a free lite version available. On Google Play you can return an app within 15 minutes of purchase if it doesn't meet your expectations, but on Amazon all sales are final. The feature is limited in that you are using the app via an emulator on a computer. If the app makes use of GPS, a camera, etc, you will not be able to test those features out. The response time from the emulated device seems pretty good. The sound might be a little delayed, but overall I was satisfied with how my app performed via the emulator. I like the idea of this feature, but I am concerned about Amazon giving away my content for free. Amazon makes you give up a lot of control over price and use when you sign their terms of service. This probably falls under the terms that I begrudgingly agreed to. It seems you get ten free minutes every time you load the app. 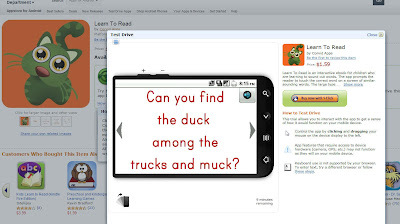 The way Learn To Read works, reloading every ten minutes doesn't really hinder the overall experience. If it was limited to a one time ten minute evaluation I would not have a problem with it. While the maximum learning benefits come from a child having the device in their hand, and running their finger along the words while they read, the app is still usable on the computer. I wonder if I will lose sales because of this? Right now I need to maintain my current level of sales for about 3 years for me to make enough money for it to have been worth my time. What is your preference for evaluating an app for purchase? Screenshots, video, a free lite version, buy and return, or use in an emulator? Would you still buy an app so you could use it on your device, versus only using it on the computer?